Grease a spingform pan and line with baking paper. Melt Nuttelex and set aside to cool. In one bowl add dry ingredients (coconut, sugar and almond meal). In another bowl whisk eggs and vanilla until combined, slowly add cooled Nuttelex. Add butter mixture to dry ingredients, stirring until smooth. 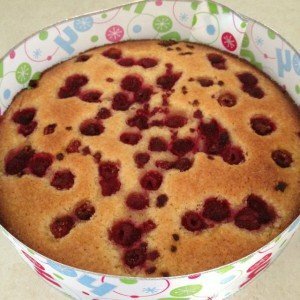 Pour into prepared cake tin, and dot the raspberries on top. Bake for 50-55 minutes (cake skewer inserted in middle should be clean). Cool in pan for 5 minutes, then cool on cake rack.